Durham is known for great cuisine. 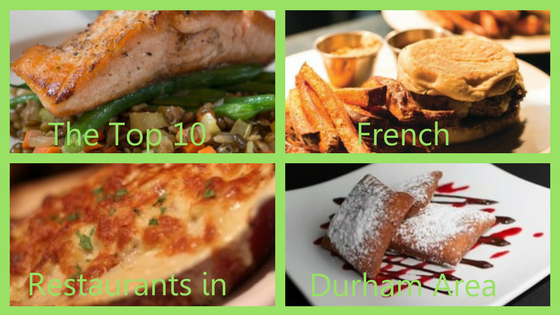 In fact, in 2013, Southern Living Magazine named Durham the “Tastiest Town in the South.” Morehead Manor Bed and Breakfast will feature the top 10 French restaurants in the Durham area, according to Yelp. 1) Vin Rouge (2010 Hillsborough Road in Durham) offers classic French cuisine (by Provincial Chef Matt Kelly) as well as an extensive wine list. Dine in an intimate, upscale atmosphere. They can accommodate private parties and events. As weather permits, they offer outdoor dining in their courtyard garden. 2) Rue Cler (401 E. Chapel Hill Street in Durham) is a comfortable Parisian bistro with rotating menus and an extensive wine list that includes rare bottles. Their food is inspired by French tradition and local, seasonal produce. Rue Cler has proudly served Downtown Durham since 2006. 3) Kitchen (764 Martin Luther King, Jr. Blvd. in Chapel Hill) is a cozy informal bistro with French fare, including mussels with fries, duck confit, and creme brulee. The wine and beer list is well curated to focus on quality and not quantity. 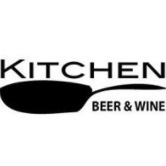 The name Kitchen is meant to evoke the image of eating in the kitchen of a good cook, without ceremony. 4) Provence (203 W. Weaver Street in Carrboro) prepares French Mediterranean specialties served in a laid-back ambiance. Provence offers an international wine list. Choose from their delicious seasonal salads and entrees and finish with one of their house made desserts such as Creme Brulee, Pain Perdu, and Chocolate Torte. 5) Margaux’s Restaurant (8111 Creedmoor Road in Raleigh) features a global menu as well as a diverse wine list. The restaurant celebrates 25 years of unforgettable dining experiences. They have an energetic ambiance and quirky decor as well as a fireplace and patio. 6) La Farm Bakery (4248 NW Cary Parkway in Cary) is a bakeshop and espresso bar with a full French and American cafe menu served all day. Their loaves are hand-crafted daily in a variety of flavors, shapes, and sizes. As well as their artisan breakfast, they offer pastries, desserts, baked goods, and cafe items. 7) Saint Jacques (6112 Falls of the Neuse Road in Raleigh) opened in 2004 and aims to showcase France’s culinary heritage. They are dedicated to using the freshest and highest quality ingredients which they source locally by working closely with North Carolina Farmers. Saint Jacques is consistently rated as one of the top restaurants in North Carolina. 8) Coquette Brasserie (4331 The Circle at North Hills in Raleigh) features French dining in an informal setting with tiled floors, banquettes, and sidewalk tables. Coquette features an exclusively French wine list, the best of beers, and classic French cocktails. Traditional brasserie meals come with crusty, fresh house made breads and memorable desserts. 9) Belgian Cafe (1232 W. Williams Street in Apex) offers the Triangle’s ultimate Belgian coffeehouse experience. Come for a Cafe latte or Lait Russe made with local, organic coffee beans. You can also take the Belgian Cafe experience with you through their variety of desserts from tarts to cakes. Chocolate lovers can indulge in their Le Fondant au Chocolat or Cake a l’Orange et Chocolat. While they offer mostly Belgian cuisine, this was still on Yelp’s top 10 French Durham area restaurants list. 10) Royale (200 E Martin Street in Raleigh) offers French-American bistro fare and cocktails served in a stylishly distressed dining room. They serve lunch and dinner Monday through Saturday. Guests of Morehead Manor Bed and Breakfast in Durham also enjoy gourmet breakfasts each morning. 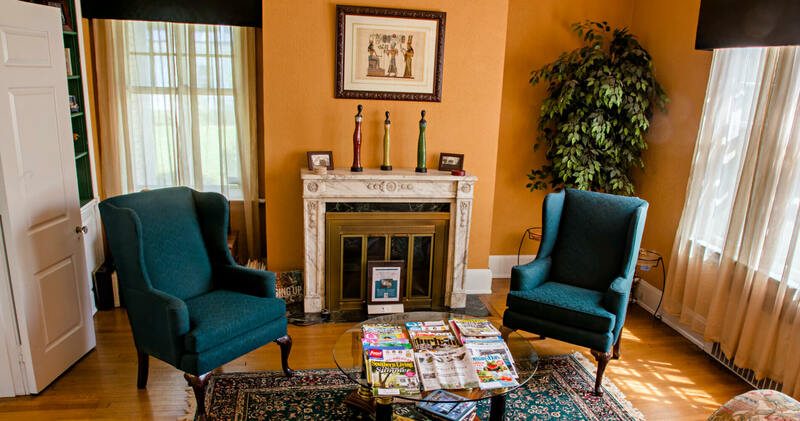 Morehead Manor can accommodate the special diets of our guests when told in advance. Bon appetit! This entry was posted in Dining and tagged cuisine, Durham, French restaurants, Morehead Manor, Tastiest Town in the South, Yelp by admin. Bookmark the permalink.